Justin Brooks Verlander was a boy on the go. So much so that when he was two years old he “knocked out his two front teeth” as he raced to get into the car. He wanted to be first to hop in and later, he ambitiously declared, “I’m hoping to be in the Hall of Fame.” When he was a young boy, he had more interest in getting good grades than he did in sports. No one really noticed that he had the potential to be gifted athletically until a “neighbor saw him playing catch with a baseball with his father.” He suggested that it might be a good idea to “get that kid in Little League.” Justin’s father, Richard, soon realized that he did indeed have a throwing arm that was a bit unusual for a child so young. It wasn’t until Justin was nine that “he joined his first youth baseball team.” Somewhat disinterested in the whole deal, as his father claimed, he was “more worried about his snack after the game.” With that amazing arm he ended up pitching, but Justin had a tendency to be wild. Coaches worked with him and “before long, he was nearly unhittable.” Unfortunately illness prevented him from playing and baseball scouts “stopped coming to his games.” Justin went off to college, but that wasn’t the end of his baseball career. You’ll learn about his recovery, his college career, how he tweaked his game, the 2004 MLB Draft, his contract, his rookie year, and you’ll learn much more about Justin Verlander and his amazing baseball career. 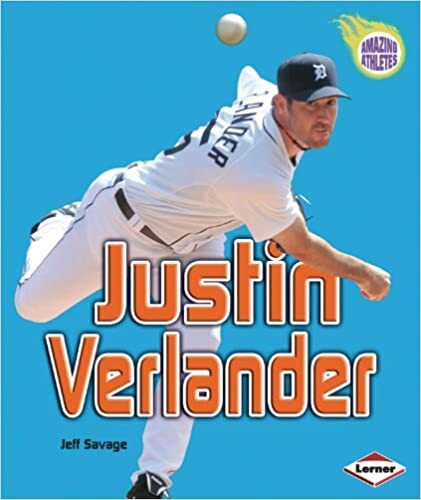 This is a fascinating look at Justin Verlander, one of the “best pitchers in Major League baseball.” Young avid fans of Justin probably already know things like the fact that he was a Cy Young Award winner, but those who are new to the game will thoroughly enjoy this biography. There are full-color captioned photographs and informative sidebars scattered throughout the book. For example, one discusses Justin’s participation in Team USA in the 2003 Pan American Games. Difficult words such as “suite” are highlighted in bold print and defined in the glossary. In the back of the book is an index, a glossary, career highlights (2002 to 2012), and additional recommended book and website resources to explore. Quill says: If you have a young baseball fan, who loves the Detroit Tigers, this is one book you may wish to consider!